This simple design with a heavy frame is a beautiful way to define the shape of your fireplace.The fireback has been an indispensable part of the fireplace tradition in Europe since the 15th Century. The colonists carried this tradition to America and today you can add that touch of elegance and history to your own fireplace, while enhancing the beauty of the focal point of your room.While many people think of our Firebacks as being purely decorative, they also serve several very practical purposes. Solid cast iron firebacks absorb heat and then radiate the heat directly into the room, making the fireplace much more efficient at heating the house. They also protect firebrick, increasing the life of the firebox and helping to prevent further damage to an aging fireplace. 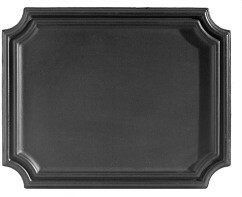 Firebacks are designed to rest on the floor of the hearth, but fireback supports may also be used to hold the fireback upright and raise it off the hearth floor if extra height is desired.Our firebacks are solid cast iron with a matte black finish.All our firebacks are designed for use with gas logs or wood burning fireplaces. This simple design with a heavy frame is a beautiful way to define the shape of your fireplace.